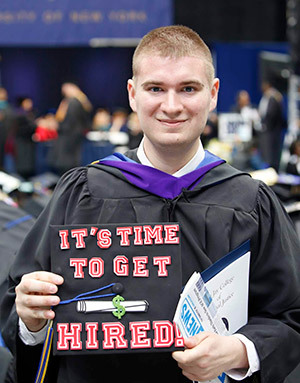 On Wednesday, May 30, 2018, John Jay College of Criminal Justice held its largest graduation to date, with over 3,700 students receiving bachelor’s and master’s degrees at the College’s 53rd Commencement ceremonies, held at Arthur Ashe Stadium in Flushing, Queens. 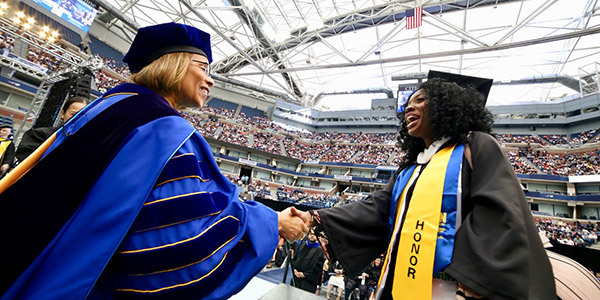 Today, the College awarded 3,110 bachelor’s degrees and 607 master’s degrees. The class included 178 military veterans and the first graduate of the Prison to College Pipeline (P2CP) Program. The students ranged in age from 19 to 74, with six pairs of siblings and two sets of twins. 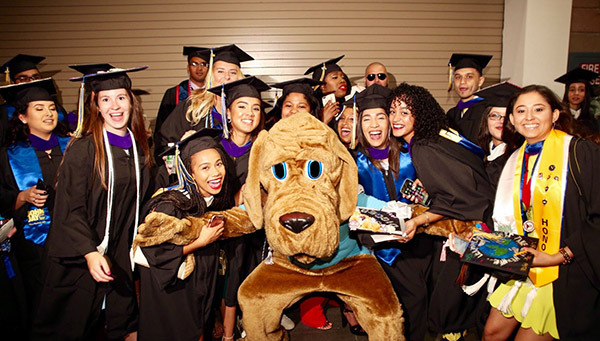 Eleven students enrolled in the College’s Accelerate, Complete and Engage (ACE) program as freshmen three years ago graduated earlier than expected and plan to enter the fields of law, healthcare and public service. ACE is a comprehensive program designed to dramatically raise graduation rates and help young people reach their full potential. Valedictorian Veronika Lizarv, a Forensic Psychology major from Brooklyn, NY, with a 4.0 GPA, led the graduating class. 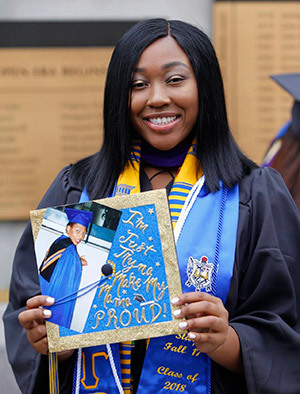 Her twin sister graduated last year with a John Jay degree in Forensic Psychology. View snapshots of a few members of the Class of 2018. In addition to awarding bachelor’s and master’s degrees, President Mason presented two honorary doctorates. At the 10:30 A.M. ceremony, Ronald V. Clarke, one of the most important figures in criminal justice research, who helped transform the study of criminology, received an honorary Doctor of Science degree. At the 3:30 P.M ceremony, Rashida Manjoo, was honored with a Doctorate of Humane letters for her work as an international human rights advocate working to establish women’s rights as human rights. Clarke reshaped crime prevention strategies worldwide with his work on situational crime prevention (SCP). Over the past 25 years, this concept has helped lead to significant crime reduction in New York City, the United States and other nations. Clarke is a University Professor at the Rutgers School of Criminal Justice and the associate director of the Center for Problem-Oriented Policing. In 2015, he received the prestigious Stockholm Prize in Criminology. Manjoo, who was the United Nations Special Rapporteur on Violence against Women from 2009 to 2015, was a trailblazer in the fight for a binding global treaty to recognize extreme domestic violence against women as a human rights violation. She was also an anti-Apartheid activist and women’s liberation campaigner in South Africa and served as the former Parliamentary Commissioner of the Commission on Gender Equality (CGE) of South Africa. She is currently the co-convenor of the Human Rights Program within the Law Faculty at the University of Cape Town. An international leader in educating for justice, John Jay College of Criminal Justice of the City University of New York is a Hispanic Serving Institution and Minority Serving Institution offering a rich liberal arts and professional studies curriculum to upwards of 15,000 undergraduate and graduate students from more than 135 nations. John Jay is home to faculty and research centers at the forefront of researching and advancing criminal and social justice reform. In teaching, scholarship and research, the College engages the theme of justice and explores fundamental human desires for fairness, equality and the rule of law. For more information, visit www.jjay.cuny.edu.